I marvel at how often the policies of the Left hurt people. Worse, the people who impose them so often don’t care about the lack of compassion in their policies. They ‘feel’ like these policies are good things, and that’s what matters. So when the people they tried to help are actually hurt, they turn a blind eye. It is this mock benevolence that is so infuriating to conservatives. 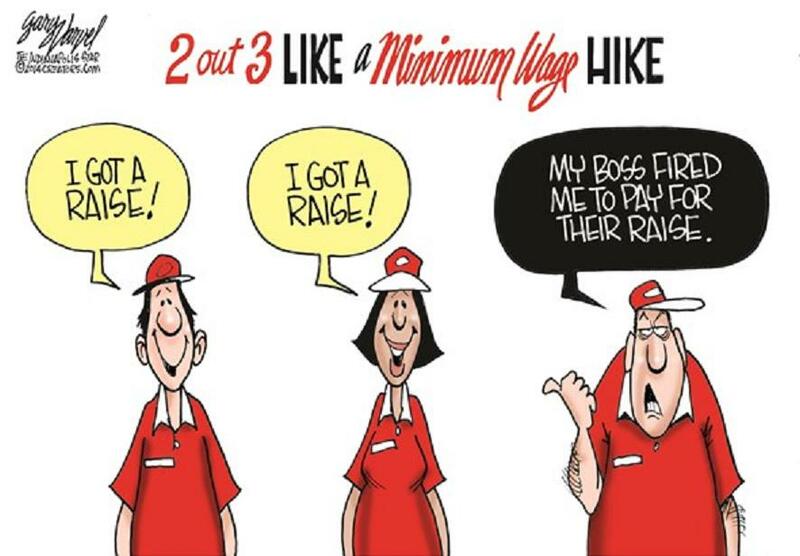 The classic example of bad public policy is the minimum wage. Some hundred academic studies have been made on the impact of the minimum wage over the past two decades. A respected economist, David Neumark, American economist and a Chancellor’s Professor of Economics at the University of California, Irvine, dissected these studies. Eighty-five percent of these studies confirm common sense that compelling businesses to pay low-skilled labor more than they’re worth kills jobs, cuts hours, and bankrupts businesses. In other words, they lack compassion by suppressing entry level job opportunities for low skill workers, like black teenagers. Before minimum wage laws were passed, black teens were more likely to hold jobs than their white counterparts. “The do-gooders believe that by passing a law saying that nobody shall get less than $2 an hour or $2.50 an hour, or whatever the minimum wage is, you are helping poor people who need the money. You are doing nothing of the kind. What you are doing is to assure that people whose skills are not sufficient to justify that kind of a wage will be unemployed. This leads me the nexus of feel-good liberalism, San Francisco, with one of the highest minimum wages in the country. Next year, the wage will rise from $13 per hour to $15. How is it working? As expected. Restaurants are closing. Low skilled workers are losing their jobs and being groomed for a lifetime of dependence upon the state. Michael Luca at Harvard Business School and Dara Lee Luca at Mathematica Policy Research researched the impact of the minimum wage on restaurants using Bay area data. Their findings? Every $1 increase in the minimum wage results in a 14% increase likelihood of an exit for 3.5 star restaurants. The elites are ignorant of the world outside of their bubbles, and the low skilled are usually ignorant of macro and micro economics. Any job I mastered in a few mos at age 17, isnt worth $15/hr. I’m not saying fast food and other low skill/wage jobs arent hard work, but they’re supposed to be the work of kids and early 20 somethings. In a robust economy, adults arent trying to support families w/ these jobs. They just dont get that the burger I pay $1.50 for wont support the wages they want. I WONT pay $3 for a McBurger. The people eating at fast food dont have a lot of $$$. They wont pay $3 for the pitiful burgers they buy. They dont go where burgers are worth $5 b/c they cant afford it. The low skill worker needs to get skills. Its hard and exhausting to work and study while raising kids. I know. I teach them all the time. A better life has to come from SOME sort of effort and investment on their parts. In understanding these workers, I’ll say the yr I worked at such a place has made EVERY other job I had seem GREAT! That includes boot camp and working labor and delivery (EWE!). Again, it’s not a job for grown ups to support families. GO Trump! We need adult jobs that pay a living wage. I’d love to see some kids behind the counter and cooking the fries. THAT means GOOD jobs are back for grown ups.